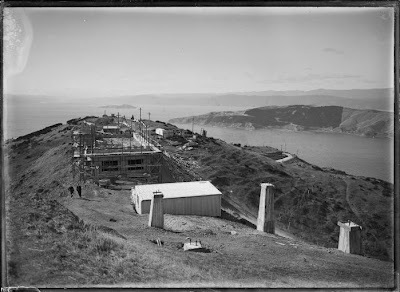 2YA radio station under construction, Mt Victoria, Wellington.1927. Thank you for your email about Radio New Zealand, which I have read. My apologies for not replying to you sooner but I receive a lot of correspondence and I like to ensure everyone gets a reply. First, I want to make it clear that I am a supporter of Radio New Zealand and a regular listener. I also want to make it clear that Radio New Zealand does not need “saving,” quite simply because its existence is not under threat. However, Radio New Zealand is one of the vast majority of state owned operations that are being required to tighten their belts thanks to the recessionary environment this government inherited. This doesn’t mean the government is requiring cuts to services. I have simply asked Radio New Zealand to come up with a plan for maintaining its present outputs with its present budget. Again, this scenario isn’t unique to Radio New Zealand. The government’s spending priorities at this time are law and order, health, and education. For everyone else it’s about maintaining existing services within present budgets for the foreseeable future. As a fan of Radio New Zealand I am sensitive to its cause; however as a Minister of the Crown in a country with a massive debt burden, I am equally sensitive to seeing the country emerge from its present financial difficulties by doing what’s right. I look forward to having a reasoned and constructive discussion with Radio New Zealand on its plans for maintaining its operations within its present $38 million annual budget. The problem with NZ's Pollies is that when it comes to cent saving they are second to none. They think their job is about saving cents but don't realise that all those cents make up lots and lots of dollars in reduced operations and coverage. And at the end of it all they take no responsability for what they have done because after all it was only cents they took away. They say they're not adversly affecting the situation but in real terms their cent saving culture cuts deeply and afterwards most often they will then blame the staff. Thats why to me Mr Colemans words are no longer worth one single cent, his credability on this matter is ice thin because of his performance to date. Sorry but I find everything he says now totally unbelievable. Pay hundreds of thousands, and all we get is monkeys! How sad. I thought mine was special. might be a dear john letter - but this interweb thing means we can see that and then reply - and then replay - and then reply. For myself I am still trying to track down the KPMG report which the Ministry Culture and Heritage commissioned and which the NZ Herald got a hold of through Freedom of Information request. I am just another recipient of this email blast... maybe written by a DM agency? As a professional ministerial letter drafter I knew my response from Mr C felt like a cut and paste letter. Your post confirms that for me. This was not written by someone in the dept. It was written in the Minister's office - the blaming of the entire recession on the Labour Government totally gives that away! You I'm totally responding to thank them for my cut and paste response. Many thanks for your timely response. You certainly appear more efficient than Rodney Hide, who responded to my email of 29 October 2009 with a letter sent snail mail that was dated 7 December 2009! I look forward to reading the report of your upcoming 'reasoned and constructive discussion with Radio New Zealand'. Would it be possible for your office to provide a copy of such a report to the thousands of fans who are suspicious about you and your government's intentions? It would certainly contribute to re-building trust. Can't see the problem here (apart from the dear john approach). We all know that the govt budget bid process has been a joke, and millions of dollars over the years have gone out to govt departments for activities that really haven't added a lot of value (across both parties). Given the amount of debt (which is still growing) it is entirely sensible to freeze funding in some areas. Seriously, get over it. More funding will come eventually... until then I'd rather see support go out to small businesses who are struggling... which means many many families are still hurting hurting. Dr Coleman claims to have an MBA, meaning he should understand management, direction, motivation, and the creative juices required for any company/corporation or enterprise to flourish and develop. Yet his statements as Broadcasting Minister indicate he has no understanding of the enterprise he is responsible for. He also admits he doesn't have respect from his colleagues - otherwise he would be able to successfully argue the case for RNZ to maintain its income at the rate of inflation - or at the same rate that his salary and his perks rise each year. Dr Coleman is proving to be just another political hypocrite - he happily takes pay increases siphoned from his areas of responsibilities.